What joy I feel at the sense of possibilities that await me. Also, I'm loving the fact that I don't know what is going to happen. I woke refreshed, our hotel room was nice; kitchenette, large bathroom, sitting room, king size bed, and a little patio. We took the dogs out and had a smoke. Mesquite is a dessert town about the size of Parker. It is a valley surrounded by high, craggy mountains, rust colored dirt and palm trees. We get a free breakfast with our stay so we bring the dogs back to our room and go downstairs. Baxter immediately starts crying. We have to eat in shifts. He already feels like the truck is his home, jumping right in and bunkering down. It's 8am and we need some good coffee, our iPhone tells us where the Starbucks are, to no avail. Two, are in casinos and one hasn't opened yet. Frustrated, we hit the road. We arrive in Las Vegas at 10, it's strip covered in a low lying poullition cloud. It's warm ish, a balmy 50 degrees. I think we have left the cold behind us. We stop and get a Starbucks and some gas. Back on the road we snack on some of mom's rum cake and I read our book aloud. 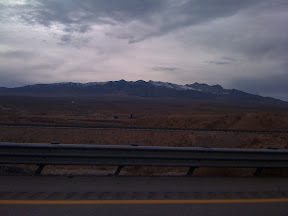 We enter California at 11, drive through the Mojave Dessert at noon. It's getting warmer, 58 degrees. At 12:30, we stop in Baker for "the best gyros in the world" at the "world famous" Mad Greek Cafe. The gyros are the best I've ever had, Dan says he's had better but these were excellent. 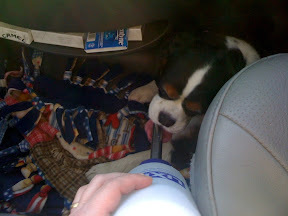 We feed the dogs and, back in the car I give Lucy a drink. Arriving in Hollywood at 5pm, our trip gets frustrating. We are in a city that doesn't have much space, driving a large U Haul truck and trailer with a hotel clerk who doesn't want to work. The parking lot he reccomends is covered and we can't fit. We decide to try and ditch the trailer, I'll drive the jeep, Dan the U Haul truck. We have to drive to the U Haul in Van Nuys. 24 miles and 90 minutes later we are back to the hotel looking for a place to park the U Haul truck. An hour later, one person is willing to let us park over night, if we are willing to pay for it, which, at this point, we'll pay anything! Finally, 3 hours after we got to our hotel, I get to rest. I take a shower and unpack while Dan tries to find a place to park the jeep over night and bring back some dinner. We can't leave the dogs unattended in this dump. Nothing like last nights hotel, this is small, no WI-FI, the remote doesn't work, there is no Kleenex, shampoo, or lotion which is a bummer since that stuff is in the truck. Dan and I don't care for LA or Hollywood. The drivers are aggressive, getting into your lane dispite the fact that you're not letting them in (I'm trying to follow Dan). The people cross the street while tapping away on their phones or just looking at something else, oblivious either way. Too much noise and too many people. Of course we are extremely cranky and that may have some bearing on our opinion, but still! Dan comes back 30 minutes later with burritos. We eat them, walk the dogs and get the shampoo from the truck. It's 9:30 and I'm ready for bed! Dan has done an excellent job of safely manuvering the truck and and trailer, driving 26 hours in the last 2 days. His legs and back are stiff and crampy. But, he still manages to be in a decent mood, the food and bed helping him get there.